In the above photo are some of a motley group of citizens who are funding the construction of a Ganga style stone mantapa to house the recently discovered 750CE Kittayya-Hebbal inscription stone! This could well be the first time ever in the world a group of ordinary citizens are coming together to help conserve and celebrate a city’s written heritage in this manner. In the photo they are seen holding accurate 1/8 scale brass mementos of the incredible Kittayya-Hebbal inscription. These same mementos are now proudly displayed in showcases in their homes and offices – a first again in that an hoary inscription replica has made its way to the homes of so many ordinary citizens! Why is this Inscription important? This is the oldest writing (1250 years old) in the city of Bengaluru, predating the earliest available literary work in Kannada Kavirajamarga by about 100 years. For a city renown the world over for its educated citizens (scientists, IT professionals, doctors, writers…) this 1250-year record of literacy in the city is something to be cherished and celebrated by all Bengalureans. The inscription mentions Kittayya by name. Kittayya is the earliest known named resident of modern-day Bengaluru — this makes Kittayya Bengaluru’s first citizen in its truest sense! Since the inscription names Hebbal, we now know the oldest locality in the city of Bengaluru to be Hebbal. While there are a few cities in India and elsewhere in the world that have a past going back many thousand years, there are not many global cities which can claim to localities that go back a thousand years or more! Imagine a situation where Kittayya fails to fend off the attack on Hebbal-30 and Rashtrakutta attackers successfully raze Hebbal to the ground. This would have weakened the Hebbal-30 (perbolala nadu muvatu) region – the Jakkur-Allalasandra-Horamavu-Hessarghatta area, potentially resulting in Yelahanka Nadu being a non-starter in the 10th century. Imagine a similar scenario playing out in South Bengaluru – the Begur region of 8-9th century. Let’s imagine that an Eryanga of Kanelli or Perunasetty and Buttanapati of Begur and others had failed to defend attacks on Begur thereby weakening the Begur Naadu. Consequently would this weak inconsequential region with no hotspots such as Yelahanka or Begur naadus interest someone to build a fort and a town that would thrive on commerce (Kempegowda and the Petes)? The model of mantapa to be built for Kittaya. If there were no fort and commercial hub would the Mysore kings (Wodeyars, Hyder, Tipu…) develop the town? If there were no thriving town would a foreign invader (the British) attack and setup a substantial military base? If there were no big British base would the city have subsequently developed into a thriving global city that it has after independence? If Bengaluru were not a global city would you be reading this ? Evidently Kittayya has played a key role in helping Bangalore become what it is today. While we can claim to be self-made etc. people like Kittayya, 1300 years ago, have helped by giving us a leg up too. Therefore, as an expression of gratitude and an honest acknowledgement of his role this motley team of concerned Bengalureans deem it worthwhile to house him in a Ganga style mantapa truly reflective of the dignity he deserves. 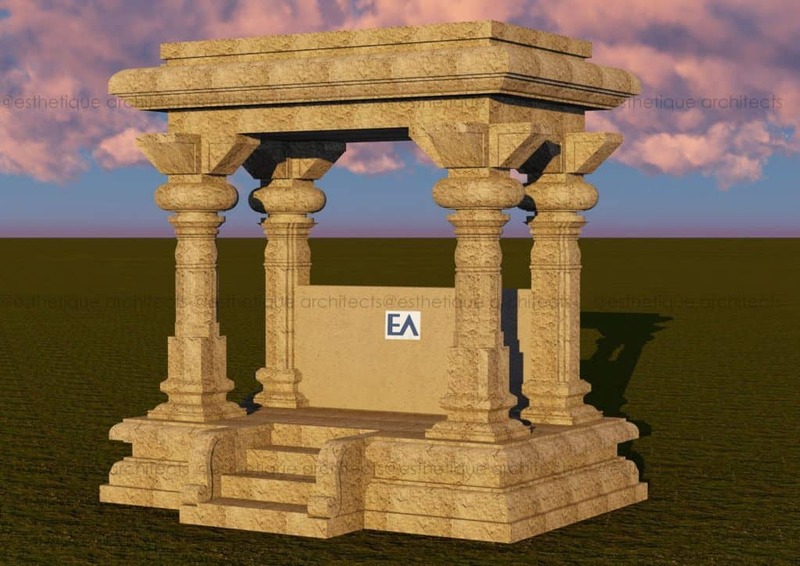 And in true spirit of the project a Bengaluru architect Ms. Yashaswini Sharma of Esthétique Architects has designed a Ganga style stone mantappa to house the Kittayya-Hebbal inscription stone. 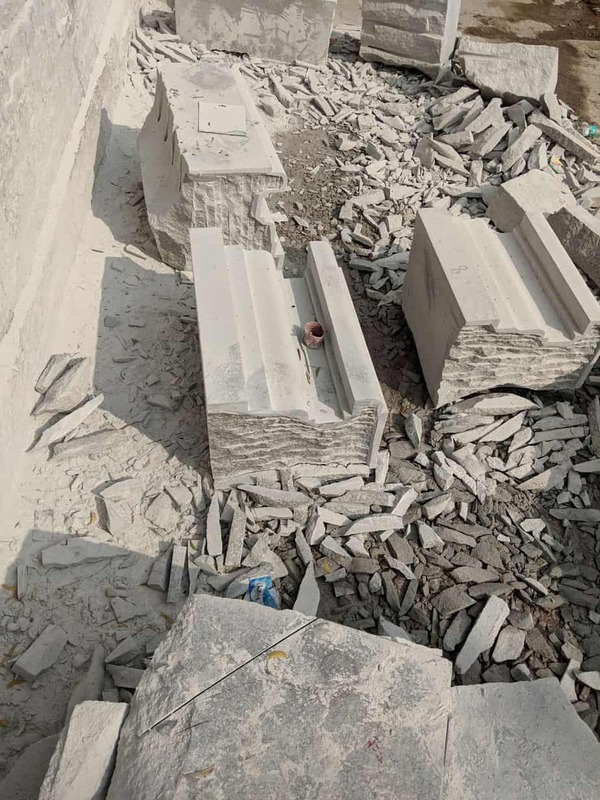 In June 2018, Dilip Kshatriya, a resident of Hebbal contacted Revival Heritage Hub (RHH), a Bengaluru-based citizens group engaged in heritage conservation and requested help to shift four “puja” stones that were in a road side ditch in Hebbal. 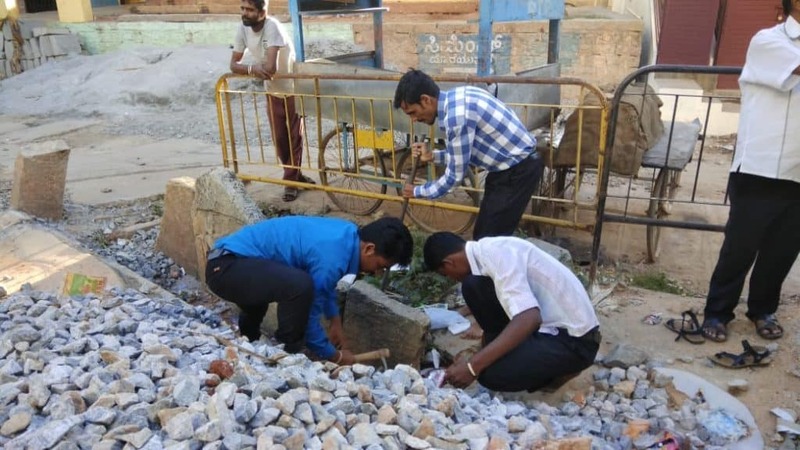 As often happens done during election times, feverish road repair works were underway in Hebbal too and he thought these “puja” stones were likely to be destroyed in the road repair work. RHH team members responding to his call dug out the stones on June 20. 2018 and to their wonder one “puja” stone, a veeragallu, revealed 5 lines of ancient writing on its so far buried under the earth portion. Within hours of discovery of the inscription, epigraphist P V Krishnamurthy had identified the inscription to be from eighth century AD Ganga king Sripurusha’s time and that it was very likely the oldest inscription discovered in the city of Bengaluru. As some parts of the stone were flaked and the inscription weathered, he found it challenging to read fully the inscription. 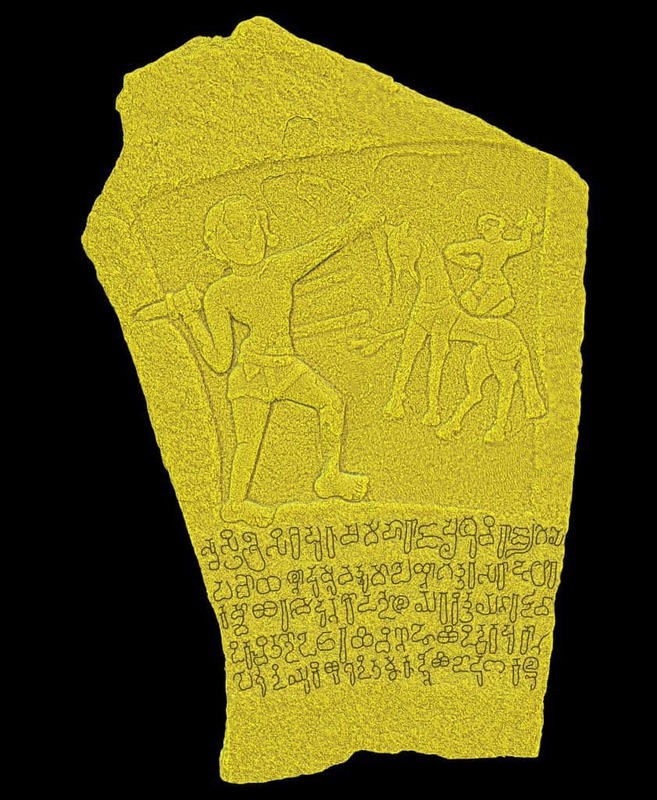 Subsequently the inscription was 3D digital scanned at 50micron accuracy levels (thanks to ALTEM Technologies who scanned using an ARTEC Space Spider 3D scanner) and high-resolution digital images from the 3D scan model helped him read the inscription completely. He has documented the complete inscription in an article published in the magazine Itihasa Darpana, Vol 37-38, April-Sep 2018 edition. Why is the Mantapa being crowdfunded? While many Bengalureans are aware of the city’s history from the time of Kempe Gowda, Bengaluru has a recorded history of civilization going back many thousand years. Evidences of this past are in stone age tombs, Mesolithic tools and Roman coins discovered at Bellandur, Jallahalli, Yeshwantpur and so on. As of early 1900s, Bengaluru had over 150 stone inscriptions. These inscriptions were from the eighth century AD onwards and found in all parts of the city. These are original documentations of the culture, religion, language and many fascinating aspects of the society of the time they were installed. These inscription stones were documented by B.L. Rice between 1894 to 1905 in his remarkable twelve-volume book Epigraphia Carnatica. Sadly, rampant, uncaring urbanisation has caused the destruction of over 70% of these inscription stones. Even those few that have survived are largely unrecognised, unappreciated and located in pitiable surroundings. Bengalureans urgently need to recognise the value of these inscription stones and secure them from further destruction. 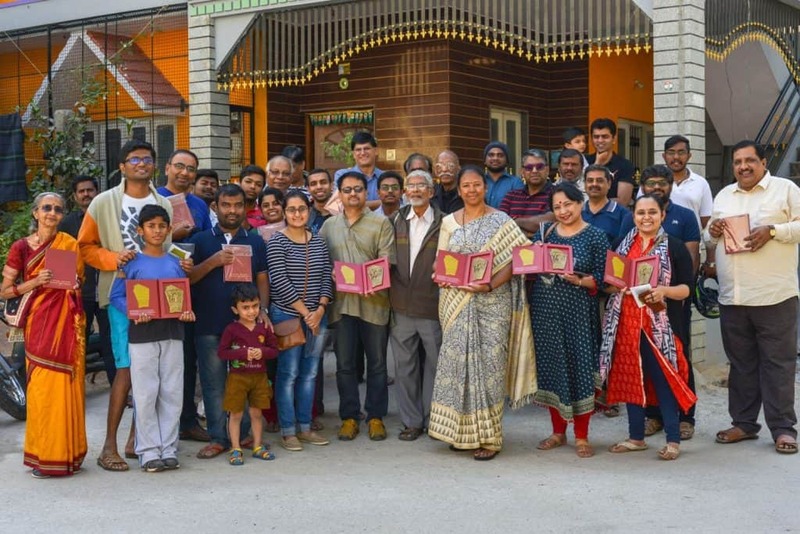 ‘Inscription Stones of Bengaluru’ is a citizen project to raise awareness and protect ancient inscription stones found in the Bengaluru region. The project retraces B.L. Rice’s footsteps and uses modern technology and methods to help in the preservation of these incredible inscription stones. The team has been successful in securing nine of the sixteen inscription stones it identified as critically endangered (sitting at the edge of busy road exposed to heavy traffic, located in the side passage of a private building..) by reinstalling them in better, safer public locations in close vicinity of the original location of the inscription. The team works in conjunction with residents and government bodies such as the Archaeology Department and the city Corporation for this. However, the learning of the team is that despite its many best efforts the city’s incredible heritage in inscription stones remains poorly understood and appreciated. Therefore, the threat of destruction and loss of these inscription stones still remains high due to public ignorance and indifference. So, for the incredible 750CE Kittayya-Hebbal inscription a different strategy in trying to involve a large number of ordinary citizens in the conservation and celebration efforts has been adopted. Crowd-funding is being attempted as the means to generate funds for the Ganga style mantapa. Donors are given Kittayya-Hebbal inscription’s accurate brass replicas that are 1/8th of the scale. 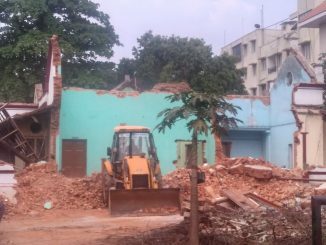 So far about 300 citizens in Bengaluru, Chennai, Hyderabad, Mumbai, Dubai, Sydney and Melbourne have contributed to the project and funds gathered so far are just enough to cover the cost of the adhisthtana (base). Sculptors have finished work on the sculpted stone segments of the base and these are to be shortly installed after completion of the foundation for the mantapa. The hope is to cover the rest 2/3rds of the cost also by small citizen donations as opposed to a few large donors. The rationale for wanting many small donors is that Kittayya belongs to everyone and his mantapa should be act of celebration and expression of gratitude by the masses! This video below features some of the group members talk about the project. Old wine in a new bottle or … ? 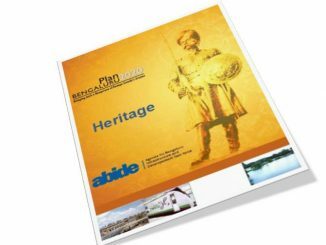 The ABIDe recommendations on heritage tries to present a cohesive policy for the protection of the Bengaluru’s cultural riches. But will it be a participative exercise?